This is the BEST deal we've EVER offered on a bicycle in our 18-year history! We saved it for a special bike at a special time of year, because we can't think of a better-looking bike to find by the tree on Christmas morning. The Electra Indy is a bullet tank cruiser bicycle with Shimano Nexus Internal 3-Speed, vintage balloon tires, and coaster brakes. It's lighter than it looks thanks to an aluminum frame that will carve mean streets with ease. 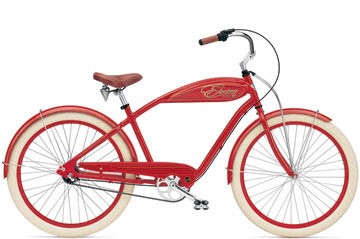 Pinstriped fenders and a dual-spring leatherette saddle mean total vintage flair on every ride. The Electra Indy is awesome-looking and awesome-riding. If you've never taken an Electra for a test ride, you gotta give it a try. Sure, you may already own a road bike or a mountain bike - now you need the ultimate around-town bike! And did we mention how awesome it looks?! Hot Deal #3 is good only December 3 through December 16, 2009, or while supplies last. (Hot Deals #1 and #2 both sold out, so we don't recommend dawdling!) In-store purchase only; no online or phone orders accepted. No coupon necessary. CANNOT be combined with Holiday Sale discounts or coupons, but it CAN be combined with Crazy Christmas Sweater Saturdays. Click here for more information about them. 40% of urban travel in the U.S. is 2 miles or less, and 90% of those trips are made in cars. Just about anybody can pedal about 2 miles, no matter what condition they are in, and you don't need to wear any special clothing or shoes to do it (although we still recommend a helmet!). If 1 million people made just 1 of those 2-mile trips per week with a bicycle instead of a car, we'd emit 50,000 less tons of carbon dioxide per year, and use 5 million less gallons of gasoline! Not to mention that shorts trips are the worst when it comes to wear and tear on a car's engine. So, you don't have to devote yourself to living completely car-free. Just try going by bike once a week! You'll feel better, look better, save money, and help save the earth! Sign up to receive a new Hot Deals for Cold Days offer by e-mail, every two weeks from now through February! Okay... so who's going to buy me this for Christmas? ;) I love the vintage look!